Marilyn Monroe stamps are, like the actress herself, intriguing and beautiful. 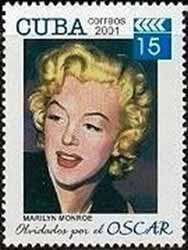 Marilyn Monroe has been honored a number of times in stamps around the world. Marilyn Monroe stamps have many great images of this beautiful actress to interest a stamp collector and/or a fan of Marilyn Monroe. Many countries have issued Marilyn Monroe stamps. This is a testament to the continuing fascination with Marilyn even though she tragically passed away just under 50 years ago on August 5, 1962. Her career was cut short. The official reason is given as suicide, but many fans think it was accidental or even murder. One of Marilyn's most famous images is a scene from The Seven Year Itch where Marilyn tries to hold her dress down while the wind from a passing subway train blows it up. 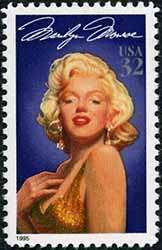 In 1995, the US Post issued its only Marilyn Monroe (Scott Number 2967) stamp to date. It was the first stamp issued of the Legends of Hollywood Series. It is based on a 1950s painting of the star, and has a face value of 32 cents. The art that was to go round the stamp (selvage art) was to be the scene described above, but the management of Marilyn's estate did not want it because they felt it demeaned here image. Instead, the art work is an image of the same painting as the stamp. The value of the stamp is not much different from 32 cents. It is a very popular stamp with many copies in circulation. The Democratic Republic of Congo were not as concerned and use the image as part of the 9 Marilyn Monroe stamps which where in black and white and issued in 2001. Many other countries have honored Marilyn Monroe such as Somalia, Grenada, Gambia, Sierra Leone, Eritrea, etc. They capture many great images of Marilyn. These stamps of Marilyn could form part of a larger collection of Hollywood movie stars from the same era. They could also be part of a collection of US president and the women associated with him. Marilyn Monroe stamps issued to date celebrate her too short life.